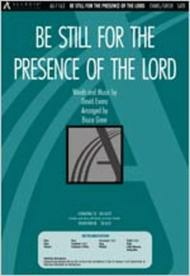 Be Still for the Presence of the Lord (Anthem) composed by David Evans. Arranged by Bruce Greer. For SATB choir. Anthems. Call to worship; choral anthem. Praise & Worship and Sacred. Octavo. 12 pages. Duration 3 minutes, 27 seconds. Published by Allegis (LP.AG-1163).ISBN 9780834171596. Praise & Worship and Sacred.A compelling call to worship and devotion. A gentle and sensitive urging us to be still in God's presence. Bruce Greer's arrangement of a song by David Evans.